For those who do not live in Goa, the place is almost always associated with holidays. And those who go on a holiday to Goa would be most reluctant to leave the beaches and anything else they are enjoying. My trip to Goa was for the wedding of the daughter of my childhood friend – someone who I shared almost every waking moment with, during high school and college days. Now getting away from her and that too on a Goa beach venue would not have been easy, but thank goodness, it was for something I had long wanted to do – a lecture at Goa Medical College. Every time I visited Goa, I would longingly look at the college as I passed from the airport to the holiday venue, and this time, thanks to Dr. Lalita Fernandes, who I came to know through both – the FAIMER and the MECOR programs, a lecture was arranged! On the 31st of October, I reached the college at 2.15 PM, and went to the Library Auditorium, where I had to deliver the lecture. Dr. Lalita was there with three of her PG students. I was in for a lovely surprise! 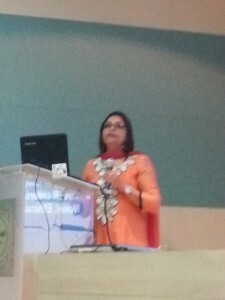 Dr Lalita Fernandes had planned a ‘scenario based introduction’ to my lecture. She told me that her students would play the roles of – fresh PG student, a guide and a senior resident – and convey the problems a student faced while searching the literature, through a role play skit. I could see that Dr Lalita had used her FAIMER training to make a difference. We rehearsed and planned this set up quickly and at 3.15 PM, the event began. Role play – No results? This entry was posted in 6 - Old posts and tagged Information Literacy, PubMed. Bookmark the permalink.